Originally constructed as the centrepiece for the ocean-themed world exhibition in 1998, the Lisbon Oceanarium (Oceanário de Lisboa) impresses visitors with its futuristic architecture and innovative marine life exhibits. Located beside the marina and water-themed gardens of Lisbon’s waterfront, it’s a popular family attraction. As one of the city’s top family attractions, Oceanário de Lisboa is featured on nearly all hop-on hop-off bus routes, which allow visitors to explore Portugal’s capital at their own pace and enjoy unobstructed views from a vantage point on the top deck. You can opt for a hassle-free package that combines a 24- or 48-hour hop-on hop-off bus pass with an Oceanário de Lisboa admission ticket, or secure a skip-the-line admission ticket, which allows you to beat long lines at the entrance booths. 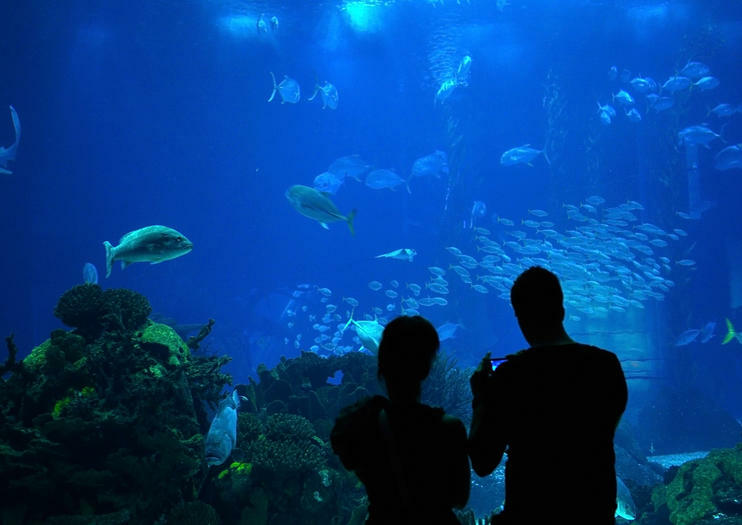 Oceanário de Lisboa is a must-visit for families and lovers of nature. Marine species are spread over four distinct exhibits, which contain sharks, manta rays, and tropical fish. Ramps and lifts in the aquarium facilitate access for wheelchairs and strollers. Check the aquarium website for the latest information on rotating temporary exhibitions. The Oceanarium is located east of Belém Tower along the River Tagus waterfront. To get there by metro, take the Red Line to Oriente station, from which it’s a 10-minute walk. Oriente metro station is only two stops and a matter of minutes from Lisbon airport, making the Oceanário de Lisboa a great choice if you’ve only got limited time in the capital. Oceanário de Lisboa is open from 10am to 8pm during the summer months, and 10am to 7pm during winter. If you want to avoid the crowds, try to visit the aquarium during the week, as it can get busy on weekends and public holidays. In addition to promoting awareness of our impact on the oceans, Oceanário de Lisboa participates in important conservation projects for endangered marine life. It heads the project for the blue-spotted ribbontail ray, found in the Indian and Pacific oceans, and oversees breeding projects involving hammerhead sharks and Magellanic penguins.